We saw an article that talks about a review criticizing Mario Kart 8 for having a lack of diversity (specifically, no non-white human players). It’s an over-senstionalized accusation any way you slice it, but, it got us thinking about Nintendo’s approach to its main iconic character. All of those are quotes from actual Mario games, too. The Japanese are shockingly, deeply, insultingly racist as a culture. I’m really not kidding. I have a friend who works there who despite doing the work of three people and keeping his entire company afloat is routinely called gaijin no baka by his boss and employees in front of clients. He gets hassled by the police all the time. So poorly written. It is like they directly sought articles bashing it. Sure it may not be humanly diverse as it says but it has so many characters from completely different (and some made up) species that this shouldn’t be a complaint in the first place. It bothered me they included Toad and Toadette as human. They’re not. They’re…. something. I can’t wait until I get out of work to pick it up. I think the series keeps getting better with each game and the two person kart system only seen in the GameCube version was interesting and fun in its own bizarre way. 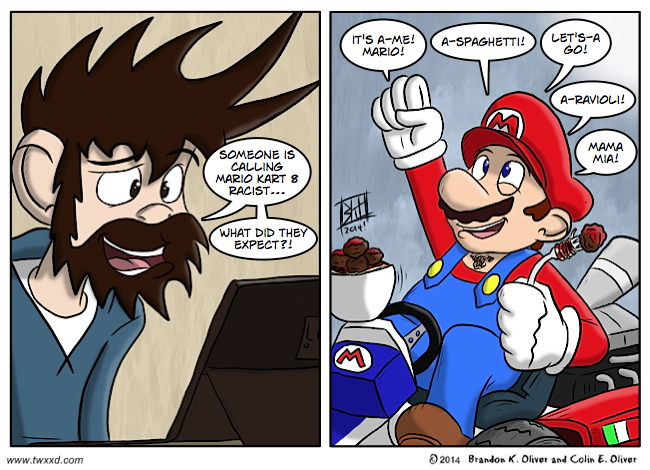 I wonder where Donkey Kong and Bowser fall into their racial arguments. Also, can you imagine if Wario and Waluigi had been black? That would be a whole other type of racism argument.